Feature photo by Spencer Klein. Photo above by jetalone. Flying allows travelers to go anywhere in the world, but has a big impact on carbon emissions. Here’s how to reduce your carbon footprint. FLYING IS OFTEN the best option to get where we want to go. It’s quick, it’s cheap, and—depending on the airport—it can be easy. But we might not be aware that it comes with a tremendous environmental price tag. That’s something not all of us realize. When you’re on one continent in the morning and another continent by the afternoon, there’s not so much time to think of what all those sky miles mean. “It’s a modern luxury that is too often taken for granted,” adds Dr. Anfinson. What does that spell for the common traveler? The reality is that people are not going to stop flying, just as they are not going to stop driving. Our transportation habits are too deeply rooted in the network of human culture. Fortunately, airline companies around the world are beginning to take notice, offering new ways to clean up the mess. 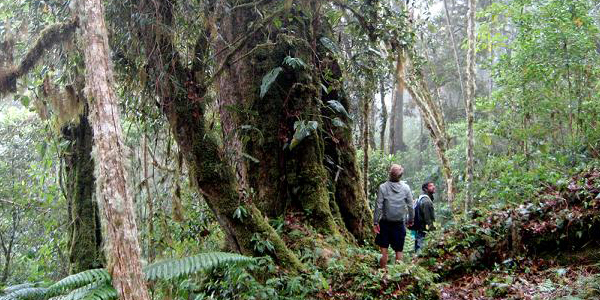 Leading the charge is Costa Rica’s Nature Air. In 2004, Nature Air became the world’s first carbon neutral airline, at a time when other airlines were only beginning to consider their impact. And they did so with no added cost to customers. By flying Nature Air, passengers are directly supporting reforestation and conservation within what many see as the country’s crown jewel, the Osa Peninsula. It seemed like a fitting move in the country that virtually invented ecotourism. In 2007 alone Costa Rica hosted 1.9 million visitors, fueling a $1.9-billion-a-year tourism industry—an industry based almost exclusively around the country’s treasured natural ecosystem. Nature Air has chosen local “conservation and reforestation efforts [within the country] as their method of compensation,” looking to protect the very lure that brought their customers to Costa Rica in the first place. By flying Nature Air, passengers are directly supporting reforestation and conservation within what many see as the country’s crown jewel, the Osa Peninsula. In addition, all company vehicles are run on 100% biodiesel. Silverjet, a British airline launched in 2007, came onto the scene claiming it was the first major carbon-neutral airline in the world. Silverjet reservations included a mandatory carbon-offset contribution in the ticket price. But luck ran out quickly; funding for the project fell through by May 2008. 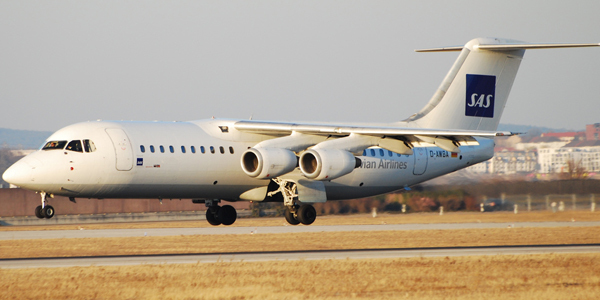 The airline offered direct flights between New York and London before its collapse. 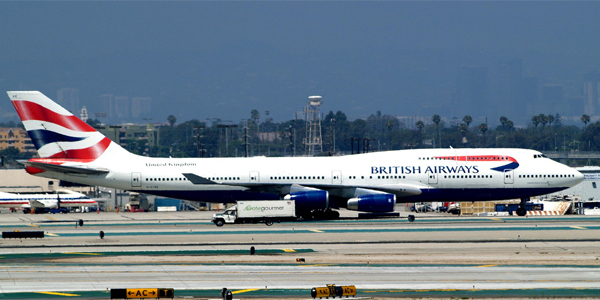 But other European carriers have taken note, including British Airways and Scandinavian Airlines System. Both have implemented voluntary carbon-offset programs so that the choice to offset the footprint of your flight is now a step in the reservation process. In general, European carriers seem to be taking more initiative to clean up the skies than their U.S. counterparts. In June 2007, Delta became the first U.S. carrier to offer a voluntary carbon-offset program. The program, GoZero, is hoping to capitalize on the growing market of environmentally-conscious consumers to aid a bottom line that only recently emerged from bankruptcy, in April 2007. In addition, GoZero provides a useful carbon calculator that can measure the carbon footprint of various lifestyle choices, such as how much we drive, how many kilowatt hours we use per year, or how often we mow the lawn. That means a roundtrip flight from coast to coast in the U.S., roughly 5,600 miles in all, would cost about $13 in addition to the ticket price. That’s not too much to ask. How do we know where all the money goes? Well, every airline program compensates for its impact differently, but in Delta’s GoZero program, every $5.50 contributed translates to one tree planted in a protected park or national wildlife refuge—a nice answer that gives concrete results. The Osa Peninsula, Costa Rica. 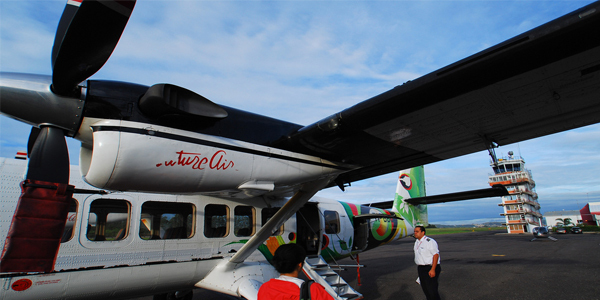 By flying Nature Air, passengers are directly supporting reforestation and conservation of this area. Photo by Spencer Klein. For those who prefer the do-it-yourself method, websites now allow you to calculate and compensate your personal carbon-footprint. Among them is the well-designed CarbonFootprint.com, which will have you treading lightly in no time. 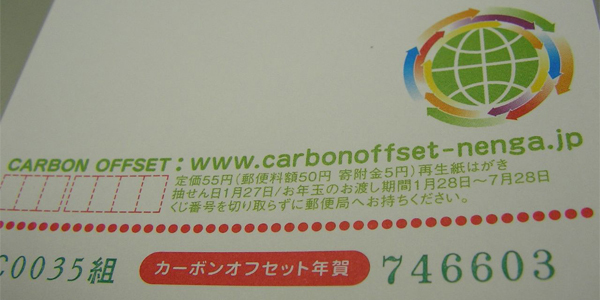 For your own consideration of what angle to take, search “carbon footprint” on any search engine. The benefit of this method is that you have the choice to decide exactly where your money will go. One way or the other, it’s a simple choice with a minimal cost—and it can go a long way in keeping airline travel a guiltless method of getting from point A to point B. As travelers and consumers, it’s time to face up to the bill and take real measures to lessen our personal impact. Responsibility means making real changes by voting with our dollar. Why not begin with that next flight?